This weekend Loughmore Community Hall will stage their annual play, “The Cormack Brothers“, a true and tragic story which occurred during turbulent years in the Ireland of the mid 19th century. The play centres about the murder of a Tipperary Land Agent & the hanging of two innocent boys for a crime they did not commit. One true story, however, very much associated with this event in history is little known and concerns investigations in and around the murder of John Ellis the land agent in question. The murder victim Ellis, was a protestant Scotsman, who was land agent to local landlord Mr John Trant of Dovea, (Latters residence is now Dovae AI station.) For 27 years the harshness with which he extracted rents from the impoverished tenants on the Trant estate and especially during the famine years, in no way endeared him to his local community. Such activity had earned for John Ellis a very unpleasant reputation indeed. He had purchased lands in the locality under the Encumbered Estates Act and proceeded to evict the peasant farmers who had holdings rented on these lands. So many enemies had John Ellis gained, that a police barracks had been erected in the townsland of Killahara, across the road from his home, Kilrush House, solely for his protection. His moral character was also greatly called into question and it was generally believed that one of his victims was Kitty Cormack, sister of Nancy, Willie & Danny Cormack. Willie & Danny Cormack (The Cormack Brothers) were later wrongfully hanged for the murder of Ellis and their grave today can be found at Loughmore parish Church with their coffins on display in an open Morselium. Mr Gore Jones resided at Cathedral St. Thurles, then known as Main Street, next door to and on the left hand side as you face the premises we now know as Mario’s Restaurant. The Cormack family had been a plain Roman Catholic peasant people living in one of the many thousands of yellow clay or sod hovels which abounded throughout Ireland at this time. The brothers were uneducated, but had both earned their living labouring for John Ellis. 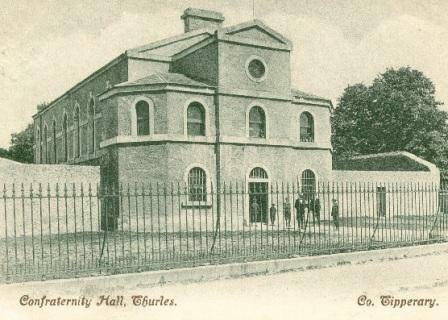 On Thursday night 22nd October 1857, 17 year old Tommy Burke took a horse and cart to Templemore railway station. His instructions were to collect Mr Ellis on his return from his weekly trip to the markets in Dublin. At 11.00 p.m. on the narrow road leading to Kilrush from the main Thurles road the cart was ambushed and John Ellis fell dead with seven slugs lodged in the area of his heart. Burke galloped the horse and cart, together with the dying occupant, to the police barracks at Killahara, but arrived too late to obtain any medical aid for his passenger. None of the five policemen appointed to guard Mr Ellis went on patrol to meet him that night because they believed that Ellis, was not returning, as was usual, from Dublin. This information they claimed had come from a patrolman’s daughter, one Lizzie Douglas. Lizzie claimed that she in turn had learned this information while playing with an 11 year old friend Ann Brophy. Eight days later she was again interrogated, but still sticking to her story, that she knew nothing, she was returned to her cell for a further eight days with only her jailer for company. When she became ill, a doctor was called and she was sent to Nenagh gaol for a further seventeen days and again detained in solitary confinement. At the end of this period she was brought back to the Bridewell (Thurles gaol) where the bed was removed from her cell and she was detained for a further 27 days. Efforts by her parents to visit her during this sixty day ordeal were denied by John Gore Jones who threatened her parents by stating: quote “you too may hang for this crime“. When she became hysterical, she was released three days before Christmas on the 22nd December 1857, thrown into the street and left to find her own way home to Killahara. Anne, through her parents, later took Gore Jones RM to court for unlawful arrest. The jury found in her favour, but Gore Jones council asked that the compensation awarded, to be the smallest coinage then available (one farthing). The jury deliberated for one hour before awarding her the princely sum of six pence in damages. Hi Masters, nice to hear from you. John Gore Jones and Letitia Sheridan were my great grandparents many generations back. This is a very helpful piece of history in my family search. So nice to hear from you Heather. If we can help you in any way with your historical research please contact us. Would someone with the Gore-Jones name be welcome in Thurles? Quick answer, “absolutely yes”. Should you decide to visit Thurles you would be welcomed by a very warm, friendly hard working people. The Gore-Jones family were a very well respected family in Thurles in the past. History, however, has a tendency to remember and highlight only that which is controversial. Should you ever decide to come amongst us, contact me and I will arrange for a tour showing you all your past history, the good & not so good, which can be found in every family background and must be accepted, and explored. History is history and must remain as such to be discussed for all our future betterment. Im interested in any murders in and around thules.. names, ect. What an interesting story, and what horrible injustice. I think it virtually impossible to grasp how the rulers of the time could justify such treatment of people. My great grandfather Thomas Long from Cloughjordan told his kids he committed the murder.